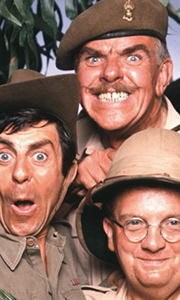 Own It Ain’t Half Hot Mum Series 1 to 8 Complete Collection DVD from Deff, DVD, Blu-Ray & 4K Video Specialists - Free UK Delivery.. The dry heat of their Indian camp is soon a fond memory for the men of the Royal Artillery Concert Party. They have a new posting in the hot and steamy jungles of Burma - a little too near to the front line. So while his troops diligently tackle the intracacies of a well-choreographed grand finale, Sergeant Major Williams waits impatiently for his 'soldiers' to get to grips with their Japanese counterparts. Contains the complete fifth .. The war in Burma offers no let up for the boys of the Royal Artillery Concert Party: the dressing room is cramped, the sweat makes their make-up run and they are called out on parade just as they reach the difficult bit of "On The Good Ship Lollipop". Life is no easier for the officers - Colonel Reynolds is down to his last dozen cases of pink gin... As Sergeant Major Williams would say: Oh, dear. How sad. Never mind." Contains the com..
Own It Ain't Half Hot Mum Series 7 DVD from Deff, DVD, Blu-Ray & 4K Video Specialists - Free UK Delivery..
Own It Ain’t Half Hot Mum Series 2 DVD from Deff, DVD, Blu-Ray & 4K Video Specialists - Free UK Delivery..
Own It Ain’t Half Hot Mum Series 3 DVD from Deff, DVD, Blu-Ray & 4K Video Specialists - Free UK Delivery..